Launch: For eastern access, Gen. Burnside State Park, Burnside, KY. There is a 6-lane launch ramp with a large parking space. 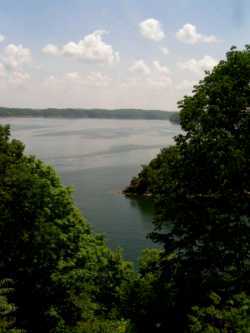 Or, for access to the western lake, launch at Lake Cumberland State Resort Park, one of KY's largest state parks. Both are busy in the summer, but easy access in spring and fall. 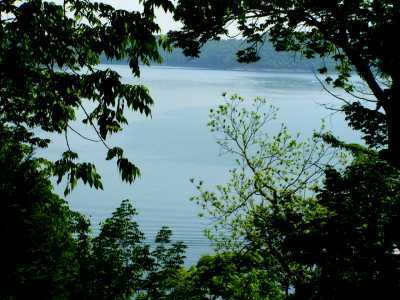 Nearby campsites: At Burnside State Park, or Lake Cumberland State Resort.The State Resort Park has lodges, cottages, golf course, tennis courts, an indoor swimming pool and an excellent dining room. Comments: This is one beautiful lake; heavily used by houseboats in the summer but marvelous off-season in spring or fall. 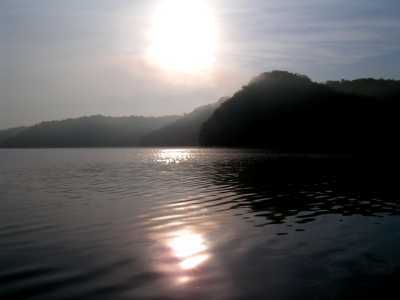 -----Lying in southern Kentucky, nestled deep into the folds of the Highland Rim of the Cumberland Plateau, is a 101-mile long 53,000-acre lake with 1,255 miles of wild, rugged shoreline - Lake Cumberland. This is one of the house-boating capitals of the country, and the recreation area has more than three million visitors a year. 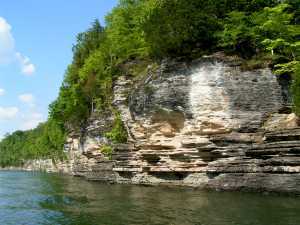 There is a good reason for this popularity - Lake Cumberland is as beautiful a mid-continent lake as one can find. -----Dr. Thomas Walker was the first European frontiersman into Kentucky. In 1750, he stood on a high bluff atop the Cumberland Plateau in what is now the southern area of the state. Surrounding him was a rugged panorama of hard flat-lying hard rocks, sliced into deep gorges, valleys, and hollows. Far below him, deeply incised into that wild landscape, was a giant river wandering into the misty distance to the west. Impressed, he named it in honor of the Duke of Cumberland, son of his King George II. -----Some 200 years later, in 1952, the Tennessee Valley Authority impounded that wild Cumberland River through the construction of Wolf Creek Dam. 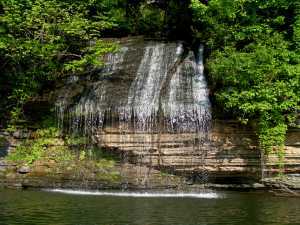 The dam was built for hydroelectric generation, but the resulting Lake Cumberland flooded that deep valley and steep creeks creating an ideal area for boating and fishing. -----Limestone is the rock of choice in the mid-continent. For hundreds of millions of years, a shallow sea lay over the middle of our continent, depositing layer after layer of limestone (or its kissing cousin, dolomite - limestone with a little extra magnesium in its chemical makeup). 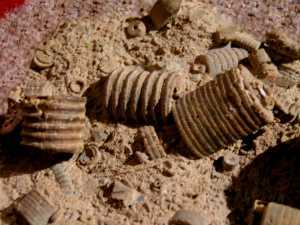 A few hundred million years ago, North America drifted into Africa, and the resulting collision wrinkled up the Appalachian Mountains. Here, far to the west of the impact zone, the crust slowly heaved upward and the sea retreated. The uplifted limestone is hard and resisted erosion, creating high plateaus incised by streams and rivers. 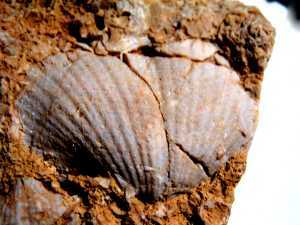 -----Those warm shallow seas teemed with life, and today one can find evidence of ancient clams, brachiopods, snails, and trilobites. 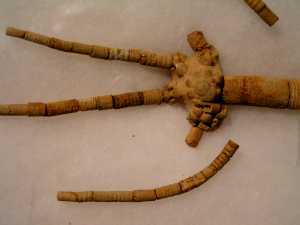 -----Crinoids, an animal that looks like a miniature palm tree, has a round columnar 'stalk' and multiple arms of smaller limy columns. 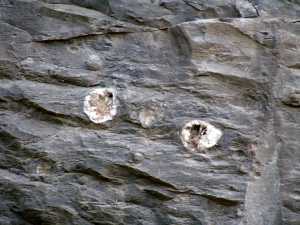 Pieces lie everywhere embedded in the limestones of Lake Cumberland. -----Ground water has percolated through the limestones, dissolving caves and cavities. 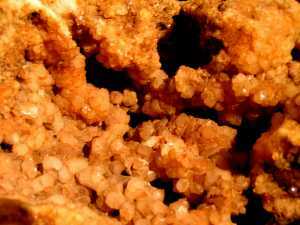 Some of these are lined with deposits from later groundwater, creating geodes - holes lined with crystals or layers of lime or quartz. -----TThere were heavy floods in the area, the week before our arrival. 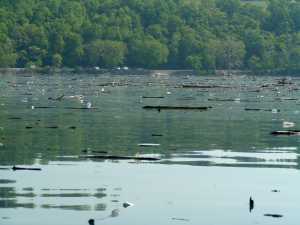 Piles of logs, sticks, and debris had washed down tributary streams. 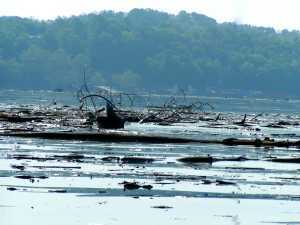 The floodwaters raised the water level of the lake to the highest point in years, washing even more logs and driftwood from beaches and shorelines. In some areas, it appeared that the lake was dammed by debris, and El stood on the bow pushing off the bigger pieces to make way for Halcyon. It was a challenge negotiating what is usually clear, unobstructed water. 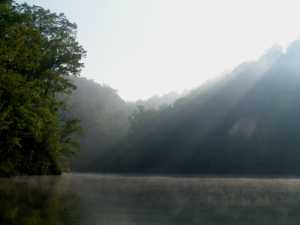 -----Lake Cumberland is renowned for its fishing. The frigid water spewing from the dam are home to some of the best trout fishing in Kentucky. 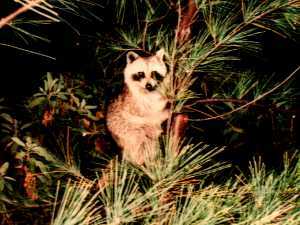 Ashore, there are many species of mammals, reptiles, amphibians, and birds. 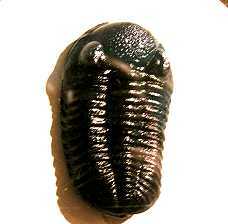 Most of the critters are used to humans, and can be easily observed at close range. The cackling burble of turkeys awakened us most mornings, whether in the campground or on anchor. 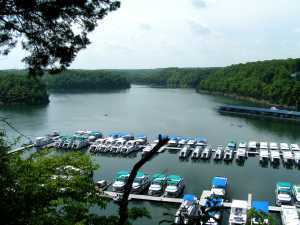 -----Some locals refer to this lake as the Houseboating Capital of the World. 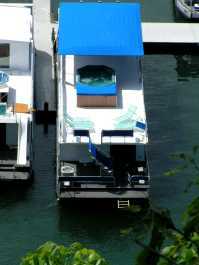 There are over 200 houseboats on the lake, many of them rentals. On any summer day, the radio is filled with calls for assistance from novice boaters trying to maneuver thousands of pounds of floating hot tub, slides, television and what all around the lake. Off season, in spring or fall, the lake is especially lonely and lovely. -----For those interested in history, there are some nearby sites worth visiting. A Civil War battlefield, The Battle of Mill Springs, lies a few miles north of the lake. The battle was fought on January 19, 1862. It was a key loss to the Confederacy and the first in a series of battles leading up to the Battle of Shiloh later in the spring. There is a self-guided driving tour at the site. -----Another short drive from the lake, is the old gristmill at Mill Springs. The mill was built in 1840 and was powered by one of the world's largest overshot waterwheels, forty feet in diameter. It was restored in the 1970's, and grinds flour on weekends in the summer. The visitor center has an interesting overview of the Civil War in this area. -----A National Landmark, Creelsboro Arch, lies near the western end of the lake a short drive from the Resort Park. This sixty-foot high and hundred-foot wide limestone arch was used by Native Americans as a shelter for millenia. Locals refer to the arch as the Rock House, and still like to hold events under its sheltering arch. -----There are at least ten major 'arms' to this lake, each unique and worth an exploration. With over 1,000 miles of shoreline, a cruiser can devote many delightful days to discovering the treasures of this lake.